 Another charge through the imperial past as Hopkirk deftly marshals facts, larger-than-life characters, and sweeping battles to demonstrate how close the Germans and their Turkish allies came to bringing down the mighty British Empire. The Anglo-Russian rivalry in Central Asia explored previously by Hopkirk in The Great Game (1992) is here overtaken by an even greater rivalry for power in the region as Germany, under the Kaiser, begins an aggressive search in the East--the infamous drang nach osten--for power and Lebensraum. This deadly rivalry would precipitate a world war, a revolution in Russia, and arbitrary divisions of land and peoples that continue to be contested today. 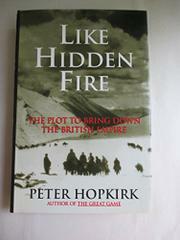 And while Hopkirk never neglects events in western Europe, his focus is on the German campaign for the hearts and minds of Muslims in the moribund Ottoman Empire, British India, Persia, and Afghanistan. By fomenting a holy war in this volatile region, Germany hoped to destroy Britain, win an empire of its own, and gain access to such vital resources as oil and cotton. By 1911 the chief of the Indian Secret Service was warning his men that a mysterious and dangerous conspiracy aimed at overthrowing British rule was spreading across the subcontinent ``like some hidden fire.'' In locales as varied as Sikh revolutionary cells in San Francisco and the Summer Palace of the Emir of Afghanistan, Hopkirk, a master of suspense, details the twisting course of this conflict with all the pace of a thriller. He offers vivid sketches of the colorful figures involved: men as ingenious as the heroes of John Buchan's Greenmantle, a fictionalized account of this same period; as ambitious as Turkish supremo Enver Pasha; and as doomed as the erstwhile Soviet heroes, the Baku Commissars. Historical writing that is remarkably accessible as well as incisive.